Aawe, I hope she feel better, and that she starts eating normally again. Hope the can help her out! I hope the vet can help her. Well, I’m. It going to go just yet. It’s every other day at the moment, with no strange treats given. So…will try the milk. Haven’t tried it sooner as we don’t usually have milk in the house! 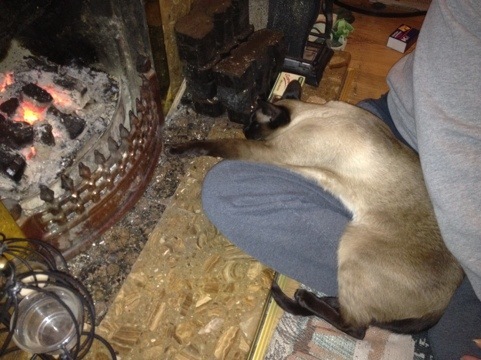 He’s not pathetic, he’s just melted. Poor pup. I know when Beanie doesn’t want to eat and her tummy is rumbly I give her yogurt. If she won’t lick that I use a little syringe and shove it down her throat. 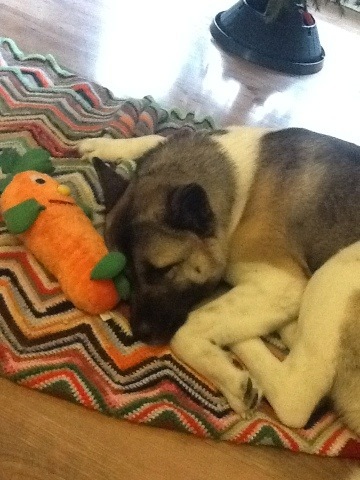 Then in about 20 mins or so she’ll get up and eat. I think when their tummies get empty and that acidy feeling they don’t know to eat. They think it’s upset instead of hungry. Hope that milk helps. It’s hard to listen to their grumbly tumblies. I think she knows eating is a bad idea, so she doesn’t. No more runs today, but I’m still worried, of course. Will try the yoghurt if milk doesn’t work. My youngest pup has the same stomach problems. They flare up occasionally and then I back off on the treats and the amount of food I give her. I think the vet said it was colitis as well. Some dogs just can’t eat like others do – like panting garbage trucks. 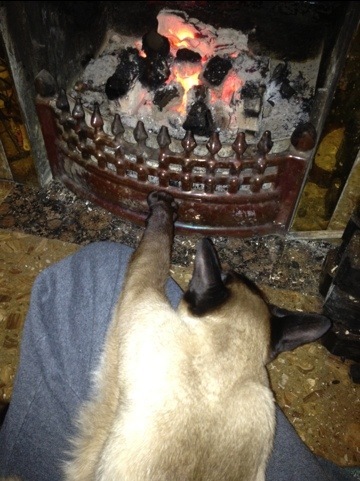 Love the photo of the cat reaching for the fire! 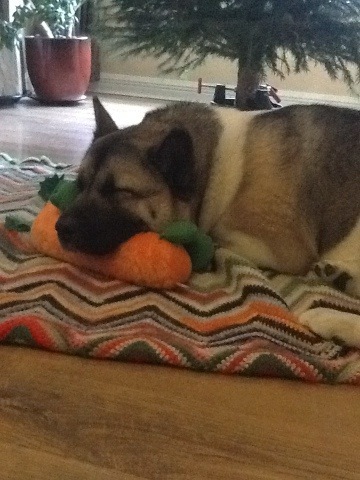 She only gets her expensive kibble and carrots as treats. It worked for months, then she started the LOUD tummy growling but not eating. The diarrhoea is new, and that’s the worrisome part. I’ll try the milk for a bit, then the yoghurt, then the asprin. Don’t want to double up on cures, I won’t know which one did the trick! Just popped in from across the pond and noticed you having a spot of troulbe with the old belly. Milk may help. if not; I have found that an anti- inflamatory works well when my bowels are acting up. Most of the discomfort is gone and my bowels settle down and make proper stools. I use IBP but you can’t give a pup that. You can safely use aspirin and I believe Tylenol. But aspirin for sure. I give it to my dogs for arthritis. If you can relieve the inflamation; you can relieve the discomfort. try it and let me know how it worked. 325 mg should be good for a dog Neko’s size. There is no cure for Colitis so treating the symptoms is all you can do. I have faith in this approach and it’s good for there heart as well as it thins the blod slightly. BTW- Neko is a really beautiful girl. Just adoreable. My wife and kids came out to have alook and we all love her. Hi! I googled the asprin – it says okay to use but a 350mg pill is right on the line for her size! They say Tylenol is a no-no, not that it matters as we don’t have it here! I do have an industrial size bottle of asprin (hard or impossible to get here, too) that my dad brought over in May, so I have it to hand for future experimentation. I’m going to try the milk then the yoghurt first: as above I don’t want to mix my ‘cures’ together. I’m a little timid to try it as she had really horrible bloody diarrhoea once – well, it was 100% blood and terrified me – so I don’t like the idea of anything that thins the blood. Thanks for the doggie-love! She’s a beauty, if neurotic and expensive. My first purebred dog – I’d rather a mutt but I’d be stuck with a sheepdog or a terrier cross – not the kinds of dog for me.